Leading a God-pleasing life, he yearned for monasticism with all his soul. After the death of his father, St Gregory used his inheritance to establish six monasteries. At Rome he founded a monastery dedicated to the holy Apostle Andrew the First-Called, where he received monastic tonsure. 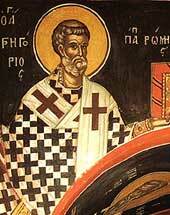 Later, on a commission of Pope Pelagius II, St Gregory lived for a while in Constantinople. There he wrote his Commentary on the Book of Job. After the death of Pope Pelagius, St Gregory was chosen to the Roman See. For seven months he would not consent to accept this service, considering himself unworthy. He finally accepted consecration only after the persistent entreaties of the clergy and flock. Wisely leading the Church, St Gregory worked tirelessly in propagating the Word of God. St Gregory compiled the Liturgy of the Presanctified Gifts in the Latin language, which before him was known only in the verbal tradition. Affirmed by the Sixth Ecumenical Council, this liturgical service was accepted by all the Orthodox Church. He zealously struggled against the Donatist heresy; he also converted the inhabitants of Brittany pagans and Goths, adhering to the Arian heresy to the True Faith. St Gregory has left behind numerous written works. After the appearance of his book, DIALOGUES CONCERNING THE LIFE AND MIRACLES OF THE ITALIAN FATHERS (DIALOGI DE VITA ET MIRACULIS PATRUM ITALIORUM), the saint was called "Dialogus." His PASTORAL RULE (or LIBER REGULAE PASTORALIS) was well-known. In this work, St Gregory describes the model of the true pastor. His letters (848), dealing with moral guidance, have also survived. St Gregory headed the Church for thirteen years, ministering to all the needs of his flock. He was characterized by an extraordinary love of poverty, for which he was granted a vision of the Lord Himself. Pope St Gregory the Great, as he is known, died in the year 604, and his relics rest in the cathedral of the holy Apostle Peter in the Vatican. you willed to walk in the path of the Gospel, most blessed one. Therefore you have received from Christ the reward of your labors. Entreat Him that He may save our souls. You taught the flock of Christ His commandments. Now you rejoice and dance with them in the mansions of heaven.